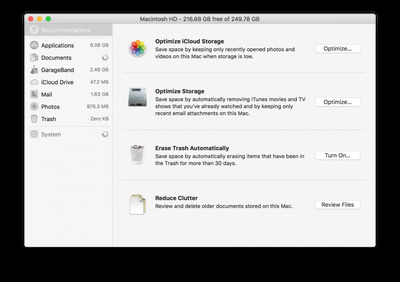 When macOS Sierra launches this fall, you’ll have a new way to save a ton of space on your Mac’s hard drive. Sierra has a new feature called storage optimization that will automatically free up space. It’s easy. Click the Apple symbol in the task bar. Click Optimise Storage next to the hard drive icon, and you’re good to go. It’s that simple. macOS will scan the files on your computer and remove stuff you don’t need like iTunes videos you’ve already viewed or email attachments. You’ll be able to download them again from iCloud whenever you want. The files will still appear in your folders or wherever you had them saved, but they won’t take up any storage until you click and download them back. The feature will also completely delete files you no longer need, like items that have been in your trash for over 30 days. If you want to try Sierra now, you can sign up to download the public beta. Just keep in mind there are probably a lot of bugs, so you’re better off installing it on a secondary Mac, not the one you use every day.